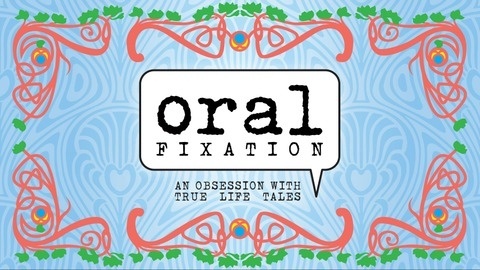 Presented by Nicole Stewart, Oral Fixation is a series of hour-long evenings of TRUE, personal stories, each with a new theme performed by a cross-section of seven Dallasites. In this episode, you'll hear the following: • Will Richey of DaVerse Lounge and the Festival of Ideas shares the story behind his passion for helping others express themselves. • Dallas social change activist Christian Yazdanpanah reveals how his childhood struggle with poverty inspires him to push for educational reform. • Mary Kreider faces her biggest fear in public speaking class. • Suzette Drouillard deepens her relationship with her daughter by sending 28 cards in 28 days for her 28th birthday. • Wayne Applebaum wanders far from his Orthodox Jewish upbringing in NYC to find his limits tested when his son develops leukemia. • Donald Griswold falls deeply in love with the neglected Russian baby he adopts after a painful chapter in his life. • Justin Nygren of The Grove takes a huge risk professionally to keep his family afloat. These stories were each shared on September 16, 2015, at Dallas City Performance Hall. Listen to them below, set to music provided by Daniel Hart and Dark Rooms.